Recently, the Lady Elks had the Christmas party with a gift exchange. I happened to make this cute little decoration. Of course, everyone loved it and I thought I would share it with you including the suppliers and everything. 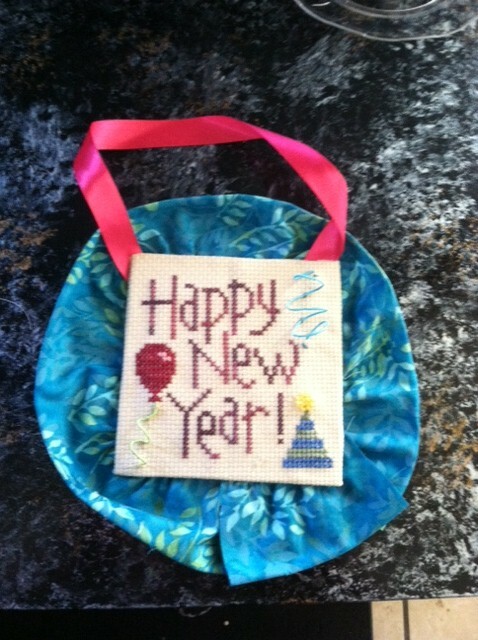 The design Happy New Year is by Lizzie Kate and took one day to stitch. For this reason, this design would be a great piece for a beginner. I used a piece of aida that I had in my fabric stash and hand dyed thread from Crescent Colors and Week Dye Works; purchased from Embroidery Central. Instead of stitching the streamer, in the top right hand corner, or the balloon string, bottom left corner, I used DMC Color Infusions Memory Thread in a blue and a green; also purchased through Embroidery Central. The fabric for the ruffle and the back of the piece, which I forgot to get a picture of, was purchased at Suppose. The bright pink ribbon was purchased for another project from Micheal’s. I am planning to post the instructions for stitching and finishing a piece like this with step by step instructions. I am aiming for February when I start on kids ornament for Valentine’s day. Anyway, Happy Stitching!